Founded in the 1920s to replicate a serene Scottish village, Bonnie Brae – meaning “pleasant hill” in Gaelic – is now a thriving, well-populated residential neighborhood in the heart of Denver. Winding tree-lined streets and hundreds of distinct, beautiful homes highlight the neighborhood. Many of Bonnie Brae’s houses were built in the innovative architectural styles of the 1920s, 30s and 40s. Here, you can find beautiful Cape Cods, brick ranches, English Tudors and examples of International Style and Art Moderne. While many of the original homes have been well-maintained or renovated, others have been replaced with newer, larger, high-end homes. Families appreciate the center of the neighborhood, where an elliptical-shaped park offers a great spot for kids to play. A charming commercial district on University Boulevard has a variety of restaurants, coffee, and pastry shops. The most popular attraction is Bonnie Brae Ice Cream parlor – one of Denver’s oldest and best places to enjoy homemade ice cream on a hot summer day. 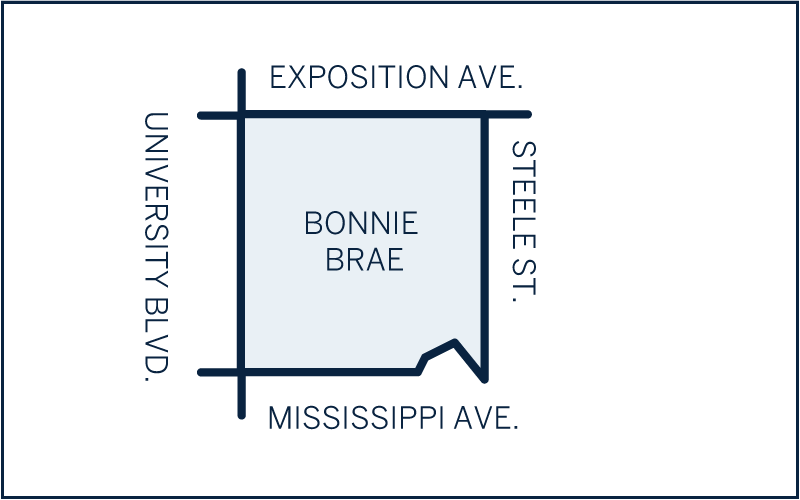 Ideally located minutes from Cherry Creek amenities with Wash Park to the West, and an easy commute to downtown and Denver Tech Center, make Bonnie Brae a favorite spot to call home.